Scrub away impurities and gently exfoliate skin with this special silicone tool. Pair it with your favorite cleanser and enjoy a deep clean and smoother-looking skin. This things works well but is pricey. 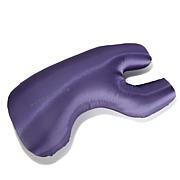 The device fits over the ends of your finger tips and if it is held with the thumb can be massaged all over the face. Adjust the seam so it doesn't come in contact with the skin. I have very dry skin that has a tendency to flake especially around the tip of my nose. Caution: Be careful about pressure applied -- use it with a good cleansing cream - at least that is what I do and so far it performs as advertised. The size is quite small but I am not at this time willing to say that is a draw back of the product - this I think will be subjective to user. This product is useless. It does nothing at all. What a waste of money.